The New York Islanders announced today that Blake Comeau has agreed to terms on a one-year deal. Comeau, 25, established career highs in goals (24), assists (22) and points (46) last season during his fifth professional campaign. He finished fourth on the club in goals and fifth in points. The Islanders selected Comeau in the second round, 47th overall, of the 2004 National Hockey League Entry Draft. 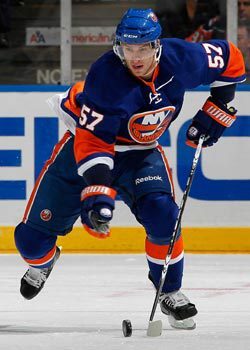 A native of Meadow Lake, SK, Comeau has totaled 121 points (56 goals and 65 assists) in 245 career NHL games, all with the Islanders. He’s also played in 111 games with the Islanders American Hockey League affiliate, the Bridgeport Sound Tigers, compiling 20 goals and 61 assists. Prior to his professional career, Comeau played four years of junior hockey with the Kelowna Rockets of the Western Hockey League. On the international stage, he won a gold medal with Team Canada at the 2006 World Junior Championships.